Flight Sergeant Vic Orton, of Quorn, and Craftsman J. Straw, of Whitwick, recently met in a leave camp in the hills of Southern India. They did not know each other previously, but found that they had many friends in the Loughborough district in common. In a letter to the Loughborough Echo containing this news, Cfn. Straw says that they send their best wishes to all at home. Cfn. Jack Straw, whose home is in Silver Street, Whitwick, writes to say that he has met Flight Sgt. 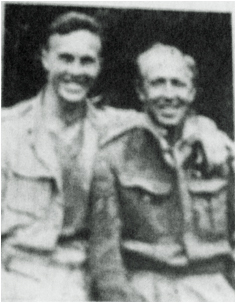 Vic Orton, of Quorn, while on leave in the hills in Southern India. They discovered that they had many friends in common and they spent an enjoyable time together.